How to Add or Remove Google's Featured Snippet? Blog » SEO » How to Add or Remove Google’s Featured Snippet? How to Add or Remove Google’s Featured Snippet? A search result on the 1st position is a dream comes true for every webmaster. However, sometimes, it is not. 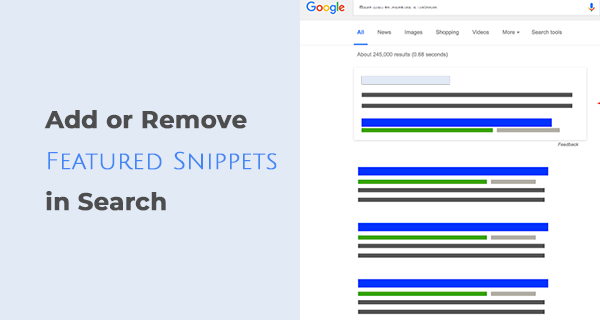 In this post, I am going to share with you how to optimize your content to get the featured snippet in Google search results as well as how you can remove it completely. You can control how your website appears in the search results. What is a Featured Snippet? For non-technical users; a featured snippet on Google is a search result on the 1st position hand-picked by Google’s algorithm. It is shown as a prominent block with a page title, content description, and link to the actual page. Google take consider page optimization, user’s query intent, and some other SEO factors to show a featured search snippet. Google programmatically collects data from a page such as it creates bullet points, pick images from the page, to give an answer to the user’s question. However, featured snippet does not always appear when a specific page or query searched by a user. Google, programmatically select specific queries when searched to show specific search results in a featured snippet. How to get a featured snippet in Google Search? Unfortunately, there’s no special tag or a specific formula to get a featured search snippet in search. There are a few ways which you can use to optimize your page. It will improve the chances of getting a featured snippet by Google. Most of my content get featured snippets (as long as I am able to rank them on the 1st page). There are no secrets, just simple old SEO techniques which are still considered as a major ranking factor by Google’s algorithm. Let me explain this in details. The first thing that you need is a fully optimized page. Make sure that you have used the best SEO practices to create this post. Now, you need to make some changes. 1- Remove unnecessary steps if it is a how-to article. If it is a tutorial then make sure that every step is explained as concisely as possible. I am not saying that you write a 100 words blog posts, I just meant you need to optimize the part where you have explained the process. 2- Add important keywords throughout your content. Remove irrelevant images, ads, and paragraphs which are making your article needlessly long. 3- If your content is long then you should divide the content into several sections. It will make it more readable and scannable for the user. Google consider this as a readability factor and give a slight boost in the ranking. Also, it helps Google gather the content to be used in the featured snippet. 4- Optimize your content for voice searches. That’s the best way to get a featured snippet. Most of the times, Google assistant pick up information from the featured snippet when answering people questions. 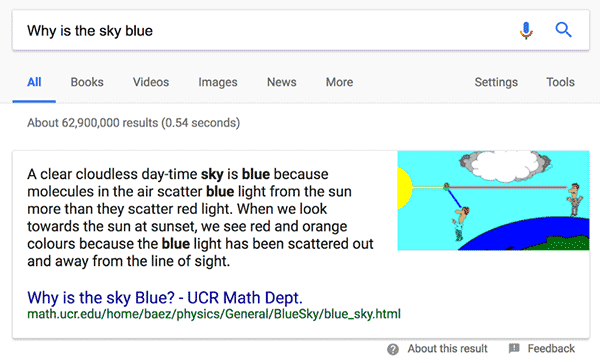 The down-side of getting a featured snippet on your article is Google tried to answer the user’s query and there are chances that Google will pick up and show the exact information the user needs. Why would he bother to click on your fancy featured snippet? Some experts argue that it is not Google’s intention to let users click on the search but stay on the Google homepage. In that case, you have an option to opt-out of the featured snippet. It is a simple process and you can easily do it by telling Googlebot to don’t show a specific page as a featured snippet in the search. How to Remove (Opt-out of) Google’s Featured Snippet? Using this code will stop your page appear as a featured snippet in Google search. Let me know in the comments if you know any other optimization tip to get a featured snippet. I hope you find this post useful. If you need help with any SEO related stuff, please feel free to send me a message. Get free access to my SEO related resources that every business should have! A digital marketing specialist who writes about website optimization and conversion hacks. © AZIB YAQOOB 2017. All rights reserved.